Life ... As it is ! : Awards galore ! About half a year ago, I received an award for my blog - ‘The Versatile Blogger Award’ all thanks to a dear friend & awesome blogger from the blogosphere - Shantala Nayak. Shantala writes at ‘Shanaya Tales’ and shares her thoughts on a variety of topics ranging from book reviews & parenting experiences to glimpses of everyday life. Being less than a year old, what attracted me to her blog earlier this year during the month-long blog-a-thon April A-Z Challenge was the similarities in our writing. Even though we both had pre-decided themes for the challenge, when our post for every day would get published we’d realize that the same topic popped up on our respective blogs. I largely relate to her blog and love reading her experiences on general living and food-for-thought posts. What also interests me is her simple yet elegant blog design. Thank you Shantala and I also owe an apology for procrastinating on completing this post for as far as I can remember. :) Thank you for giving me this award. 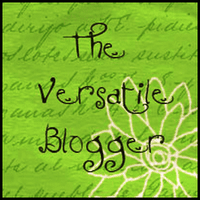 What is ‘The Versatile Blogger Award’? 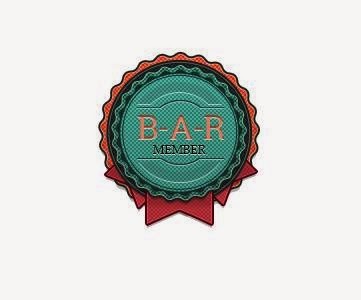 • Display the award on your blog. • Share 7 facts about yourself. • Nominate up to 15 blogs. • Link your nominees’ blogs, and let them know. If you have followed this blog for some time, you would have read about the time when I shared '10 Random Things About Me' ? If not, then what about when the Liebster Award came knocking at my door the first time ? And again the second time ? Ok ! What about the time when I had to reveal who I really am - Part 1 and Part 2 ? Well, if you still haven't had the chance to know me better then read right on as I share some facts about me which have come to be this year circa 2015. My favorite time of the day is when the house is asleep, the kitchen sink is clean and there aren't strewn around toys left to pick up because that’s when my mind is at complete ease and also abuzz with creative thoughts. I get easily affected by negativity. Whether it’s random comments or people, once it happens I keep away, rather prefer running off, from such situations for my entire life. I love reading books on historical fiction and mythology. I look forward to connecting with the blogosphere everyday and the wonderful friends I made here. Having a supportive group has rekindled my old love for letter-writing. With each passing day, I am striving to write better. At book cafes, I am constantly on the search for books that help improve my writing skills. My perspective on my work has changed. Earlier I used to work to earn better, now I work to do good in whichever way possible and feel better. That’s not all. About 2 months ago, another wonderful blogger - Janine Ripper nominated me for the ‘Sunshine Blogger Award’. Makes me wonder sometimes if my blog and I are indeed credit-worthy of these thoughtful awards. Thank you very much, Janine and sincere apologies too. I am not even going to go into why I delayed this post only because it isn’t fair to always quote - 'There is no time left in my day' or 'I have a busy life going on' - when I see such inspirational bloggers like yourself managing everything at ease and still writing beautifully. During March this year, Janine, who blogs at ‘Reflections from A Redhead’, added me to the awesome group - ‘Friday Reflections’ on Facebook and it has truly enriched me. I love the prompts provided every week and definitely give my best shot to reflect, write and share my thoughts in this group on a regular basis. Around the same time, I came across Janine’s blog too and loved how she and Mackenzie Glanville ('Reflections from Me') host this weekly linkup. 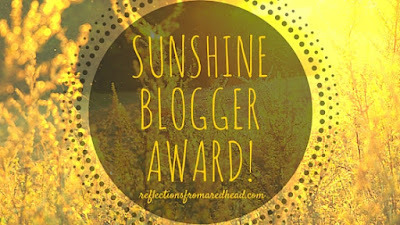 What is ‘The Sunshine Blogger Award’? The Sunshine Blogger Award is given to those who are inspiring and bring sunshine into the lives of their readers and fellow bloggers. It feels great to know that as a blogger, one's personal experiences and innate thoughts can inspire others. Over 8 years ago, around the time when I got acquainted to the term ‘blog’, a close friend shared a couple of posts from his blog. As I read his words and appreciated the metaphorical comparisons of mundane everyday chores or his unique encounters on a recent trip it intrigued me and kindled an interest with a question - “Could I write as well as him?” That nudged my inner self to wake up and start one for myself. This was my first attempt at blogging. The joy was short lived since the blog survived for 2 posts and then went into hibernation as life happened. Second time around, over 4 years ago to be precise, I came across many new bloggers and their expressive writing skills. Deep down in my heart, I wanted to own my personal space where I could just write, share, speak my obscure thoughts before they disappeared and record them in this large cyberspace. A few chosen ones of those bloggers inspired me to create that space and so a new blog evolved. What is the most positive thing that has happened to you because of blogging? 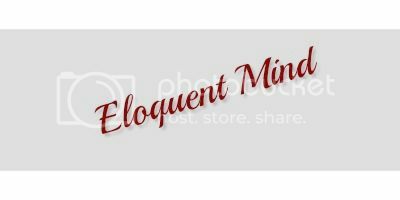 Even though my initial attempts at blogging were structured to consist of my daily chronicles of life, as I came across various blogging groups and linkups, the one thing I noticed is that there were a handful of bloggers whose writing made me appreciate myself for what I am and made me feel good from within. Now with every passing day, I realize how writing can be therapeutic. It enables you to notice the small things in life and constantly keeps your mind busy looking for ideas to share. I see myself strive everyday to write better and want to bring out a positive impact on my readers as well. Thanks to the blogging world, I now have a constant urge voicing inside of me to appreciate life, capture my feelings, record the expressions and express gratitude every single day of my life. What do you do to keep positive and live an inspired life? Actually, it’s a mixup of different things. I look for inspirational books at the library or the book cafe, I listen to old classics which transport me back in time and make me want to relive good memories. It also makes me look back at some sad memories as well but then I realize how far I have come since then and feel hopeful again. On alternate evenings, I keep myself busy in my dance class for an hour or so when nothing else can penetrate into me. I find myself most relaxed then as my entire focus is on my students and everything else ceases to exist. It feels good to indulge in my passion. On most of the weekdays, the schedule is jam-packed with the management of the dance institution, classes, driving around for the toddler’s play school classes, reading and catching up on other creative projects. Weekends are reserved for dance performances & shows in & around the city, home management, traveling, watching movies and sheer laziness otherwise. Having a toddler doesn't quite give me an opportunity to relax on a couch and sip on green tea but then when the little one naps, I love listening to music, reading books, watching feel-good movies or reruns of old TV shows. On which topic do you enjoy blogging about the most ? How has blogging helped you in your life - emotionally and socially? If you had to shut down your blog tomorrow, what would you write about in the last post ? When do you enjoy blogging - in the early hours of the day or late hours of the night ? Why ? Do you have a writing process ? Why or why not ? Please leave a link to your post in the comments section so I can stop by later. Love this and the fact you took time to answer, Remember I said no pressure! But I loved reading your answers and look at all of your awards - you go girl! Congratulations on the awards! I really enjoyed getting to know you a little better through your answers to the questions. Thank you for sharing! You are too kind, M.
Thank you and I only nominated those who I felt deserved these awards more than me. :) Waiting to hear your responses. Thank you Pixie! Glad you could stop by. Congratulation on the awards:) I an relatively new here, but I hope I visit her often in the days to come. It was lovely knowing so much about you. Congrats on the award, EM. You truly deserve it. :) And yeah, I am very happy that you nominated me. Thanks a lot dear.